RECEIVE A MINI SPLIT INSTALLATION QUOTE! 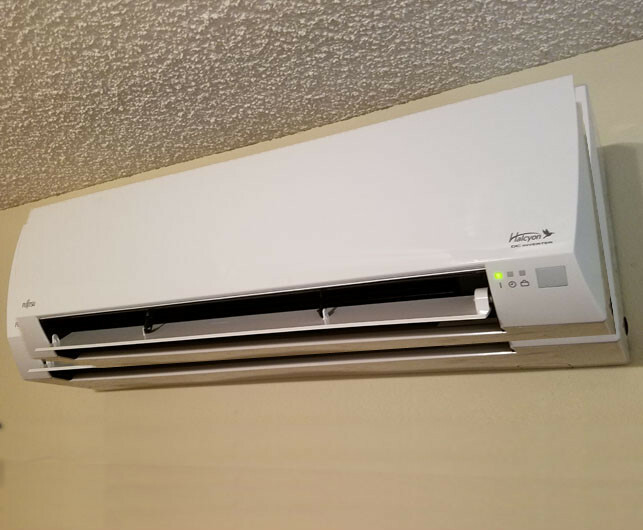 If you are searching for “mini split ac”, “mini split ac installation”, “Mitsubishi mini split ac”, “mini split ac reviews”, “ductless air conditioning”, “ductless mini splits” or “ductless mini split systems” in Phoenix, Alternative Energy, LLC can help! When comparing central ac vs. ductless ac, ductless systems are more efficient, quieter and provide greater levels of comfort! Receive a free mini split ac installation quote by giving Alternative Energy, LLC a call today at (480) 744-1803. Alternative Energy, LLC provides mini split ac installation, also known as ductless ac installation for homes and garages in the local Phoenix, Arizona areas and sourounding cities including Mesa, Paradise Valley, Cave creek, Fountain Hills and more. 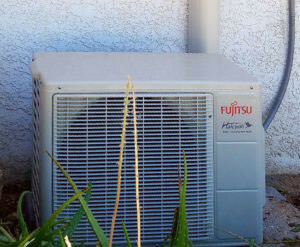 What Is A Mini Split AC Unit? A mini split are small ac units, when compared to a central ac units, that have 2 main components needed for operation: A small indoor unit that cools the air and an larger outdoor unit where the compressor and condenser are located. A conduit links the indoor and outdoor units together. The conduit houses the condensate drain, suction tubing, refrigerant tubing and power cable. We install all of the major brands of ductless ac units including: Mitsubishi, Hitachi, Lennox, Carrier and LG mini split systems. 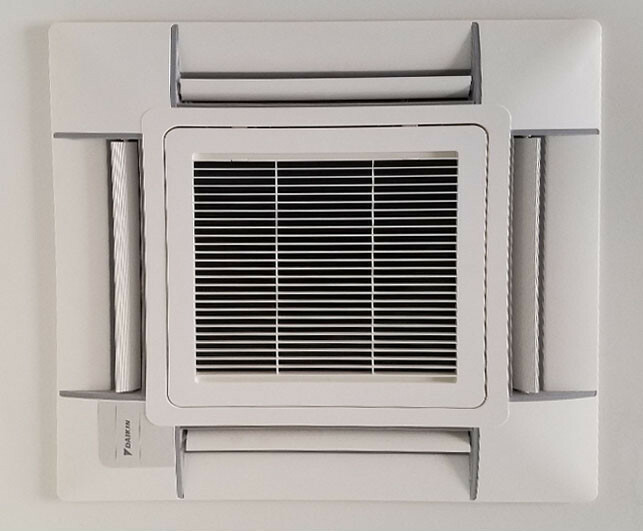 These ductless ac units come with many different mounting/installation options including ceiling cassette, high wall, floor mounted and hidden. We specialize in both ceiling and wall mounted ductless ac installation in the Phoenix Valley. These are 3 Ton Mini splits. The exterior unit has 6 white wrapped copper lines coming out of it which powers 3 interior 1 ton units. 1 can be a ceiling receptacle, 1 can be a wall mount and 1 can be a multi zone flat duct which can contribute air into multiple adjacent rooms at the same time. Any combination of the 3 will work. Typically it is cheaper to do a single 1 Ton mini split units per each of the desired rooms but with more intricate applications like this home then you can spend more money to put them wherever you want. Ceiling Mounted Mini Split Systems are great for new construction installations. They also are perfect for anyone who is looking for a cleaner installation where most of the unit and venting systems are hidden from view. This helps the unit blend with your home better and makes for a cleaner installation. Wall Mounted Mini Split Systems are great for anyone who is looking for a low-cost ac installation solution for their existing home. These units are attached to the walls on the inside of your home. No matter what brand of mini split system you need, Alternative Energy, LLC can handle the installation. Can I Install Ductless Air Conditioning In My Garage? Yes, you absolutely can install ductless air conditioning for garages and we actually recommend it. Installing a mini split ac in your garage can turn your garage into the workshop of your dreams. Installing mini splits and garage door insulation are actually the best 2 ways to cool your garage in Arizona. 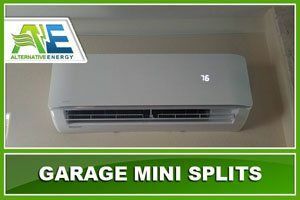 Garage mini split ac units are also great for cooling garages with no windows and heating and cooling a garage workshop. Ductless mini-split ac systems or commercial split systems are most commonly used in commercial buildings. They are perfect for offices with unconditioned space, apartment buildings, and other commercial spaces. If you’re thinking about switching to a ductless ac unit or looking for ductless ac replacement, Alternative Energy, LLC can help! We offer replacement of ceiling and wall mounted ductless ac units and can get you the system you need at an affordable price. How Much Does Ductless Mini Split Installation Cost? According to HomeAdvisor, the average cost of ductless mini split installation is about $2,000; with low costs averaging $2,000 and high costs averaging $4,500. How Much Does Mini-Split AC Cost to Run? A mini split ac unit will cost 20% to 60% less than central ac units do. However, each system will vary by external temperatures, climate, current insulation levels and the size of your home. Get a free Mini Split AC Installation Quote anywhere in the Phoenix Valley by giving Alternative Energy, LLC a call today at (480) 744-1803 or by filling out our contact form.